Pot advocates may soon be rejoicing after President Donald Trump's announcement on Wednesday afternoon that Jeff Sessions would no longer be his attorney general. Immediately following Sessions’s ousting, cannabis stocks, like India Globalization Capital and Tilray, jumped significantly. IGC rose nearly 40 percent, Tilray 26 percent. Other stocks, like Cronos Group and Canopy Growth Corp., rose just over 5 percent. The entire marijuana index was up 13.73 percent less than two hours after Sessions was removed from his position. Sessions’s appointment as attorney general in 2017 nearly sent the marijuana industry into a tailspin. A vocal opponent of the drug, he vowed to roll back many Obama era policies that relaxed federal regulation of marijuana. One of the most significant and controversial rollbacks targeted the 2013 Cole memo, which directed prosecutors to not enforce the federal ban in states that had legalized cannabis for adult use. But that hasn’t stopped more states from jumping on the legalization bandwagon. 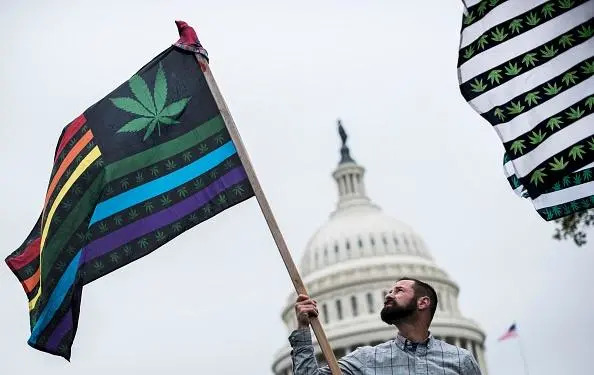 In Tuesday's midterms, voters in a handful of states decided to expand legal weed laws for both medicinal and recreational use. Michigan became the 10th state in the U.S. to fully legalize the drug for adult use, while Missouri and Utah passed measures allowing medicinal cannabis use. At times, Sessions directly contradicted the pro-weed stance often taken by Trump. The president repeatedly said he would happily consider legislation to decriminalize cannabis at the federal level, while Sessions continued to curtail marijuana policy reform. Anthony Scaramucci, the former White House communications director, recently said in an interview that Trump will start making a bigger push for marijuana legalization. “I think he’s waiting for after the midterms,” Scaramucci noted. Sessions will be temporarily replaced by his own chief of staff, Matthew Whitaker, while Trump and his administration find another attorney general. Whitaker previously served as a U.S. attorney in Iowa, where he worked to “reduce the availability of meth, cocaine, and marijuana in our communities,” according to his 2009 resignation letter.